Experience shows that there is no better way to make a positive and lasting impression on your clients and visitors than with our Indoor Logo Mats or Outdoor Logo Mats. We can inlay or print your business’s logo on a sturdy floormat that is as durable as it is beautiful, as practical as it is affordable. Our mats are available in a variety of styles for every interior and exterior need. These top-selling mats are available in a variety of styles, sizes and depths to suit many indoor environments, such as clinical, food service and industrial areas. Bulk orders can be filled, and corporate buyers are welcome. Call toll free for details. For non-logo needs, our industry-leading Commercial Entrance Mats are highly effective for removing grit and moisture from footwear. 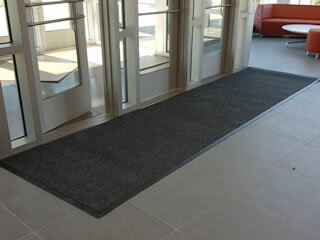 Plus, these mats have proven to enhance the appearance of any entry way. Sturdy and versatile, they are suitable for commercial facilities ranging from hotel lobbies and retail stores, to corporate offices and schools. Even homes! We can customize the size, up to 60 feet in length, to meet your exact specifications. Carpet Runner Mats for the best in general purpose office floor mat useage. We can customize lengths and widths to fit your commercial office space. Grid Entry Matting is an excellent choice for high traffic commercial industrial entrance ways where you want debris to be trapped under the surface of the mat. Designed to fit in a reccessed well area. Industrial workplace mats are designed to provide traction, safety and comfort for workers in wet or dry commercial or industrial work settings where there is grease, chemicals or other fluids. All rubber construction & flow through designs maximize durability, prevent slipping & elevate workers to ensure that liquids and other hazards do not remain on the surface of the mat where there is potential for accidents. Available in a wide range of sizes, surfaces and styles to accomodate anything from small industrial workstation areas to irregularly shaped commercial kitchen areas or full-scale commercial industrial production environments. Our extensive line of anti fatigue floormats provide comfort and stability for those individuals whose job requires standing for prolonged periods of time. Spark resistant matting is designed to protect welders and other industrial workers from embers, sparks and heated materials . 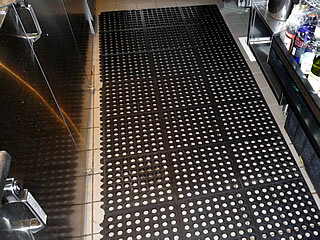 Electrostatic dissapative switchboard matting can prevent shock and other electrical hazards for both people and the sensitive electronic equipment they work on. Make an encouraging statement even before you open your door. We stock a variety of small and large, sturdy, handmade Natural Fiber Doormats that instantly accentuate even the most modest of doorways. These mats, available for single or grand double doorways, offer the ultimate protection for your interior areas because of the way they scrape unwanted dirt and debris off footwear right there at the entryway. 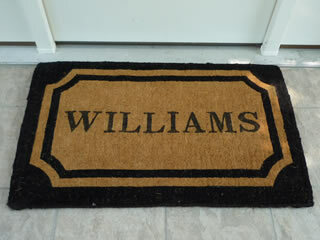 Here’s a new, unique and affordable take on gift-giving: Monogrammed Doormats or Personalized Doormats for loved ones, friends or business associates in almost any industry. (Or even for yourself!) Featuring customized lettering options at up to 18 characters, these top-quality mats come in a variety of classic designs, styles and sizes to accommodate any doorway. Don’t wait for the next holiday. Order today. We gladly accept bulk orders and welcome corporate accounts. Call for details. Fun and decorative Berber Laundry Rugs by Bacova Guild are perfect for use as a decorative accent rugs in front of your laundry machines or as a light-duty welcome mat. 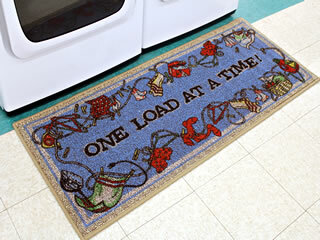 These decorative laundry room rugs are made from soft & supple olefin with non-skid latex rubber backing. They are both decorative & durable. Add some cheery color to the nursery, playroom and child’s bedroom with something from our special line of Kids Room Rugs. Vibrant designs encourage a sense of imagination, while providing soft comfort for everyday use. For the animal lovers in the house, there’s no better way to keep the cute creatures front and center than with our fun and functional series of Decorative Pet Doormats. Most popular breeds are available. And these pets never misbehave. Want to bring a little bit of the great outdoors inside? Our line of Wildlife and Nature Rugs and Specialty Decorative Rugs do the trick, safely and comfortably. It’s clear to every sports fan—not to mention professional club management and the players themselves—that custom mats and rugs with team logos are high-demand items that speak to both excitement and loyalty. Our NFL - National Football League Team Logo Mats and Area Rugs are available in more than 10 sizes and styles for each of the 32 NFL teams. And don’t forget that we also have the popular heavy-duty molded rubber car floor mats. For the professional baseball fan, the same kind of excitement and loyalty can be shown with a variety of MLB - Major League Baseball Team Logo Mats and Area Rugs available in eight styles and sizes for each of the 30 teams, as well as the bestselling line of plush nylon car mats. Holding full court for our professional basketball fans are a series of five different styles and sizes of NBA - Nation Basketball Association Team Logo Mats and Rugs.